In August I conducted a survey where I asked respondents, "What they hated most in a presentation?" The most hated habit came out to be 'too much text on the slides'. 1 in every 3 respondent was irritated the most by this. You can read the post here. Today we will understand how to overcome this problem. 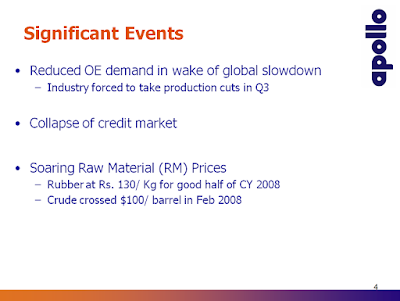 Here is a slide from the presentation of Apollo Tyres. The amount of text on this slide is way beyond acceptable level (word count = 108). What happens when there is too much text on a slide? The audience cannot read all of it, loses interest and loses understanding. They are put off. When you present a slide, they try reading the text. Immediately you also start speaking and in the end they lose out on understanding. A presentation is not supposed to be a word document which has to be read by the audience. If you really want your audience to read so much text, give them a handout (made in MS Word) and keep your slides lean. Why do you have excess words on the slide? Because you feel everything is important. You want to share everything you have discovered and analyzed. What happens if you put everything you have to say on the slide? You eliminate your need in the presentation. Why does the audience need you if everything is up there? Your presentation cannot and should not stand on its own. It has to aid you and not be self sufficient. So, start writing less and talk more. More than 50 words on a slide is too much. The lesser the text the better it is. But 50, I feel, is the maximum words you can have on a slide. Ensure none of your slides go beyond this word limit. To solve any problem, there are two steps; realize that there is a problem and take measures to solve it. This survey would have made you realize that you are putting too much text on the slides. And the fact is, your audience is not liking it. They might not tell you openly but they are feeling irritated. Time has come for you to accept it and get rid of it. After you have finished making your slides, go to every slide and cut down 50% of the words from each slide. If a slide has 100 words, bring it down to 50. Yes. This is the best way to solve your problem. Don't think "This is tough. I have written all the important things. How can I cut 50% of the words?" Believe in this rule, use it and you will realize that it is possible and immensely beneficial. No one wants to make their presentation text heavy. Still an audience poll reveals that almost every presentation is heavy on text. What you feel important is actually excess fat (unwanted text) which is creating a problem. When you force yourself to cut down 50% words, you will be able to make a much leaner and better presentation. After you have finished making a presentation. Take a break. Then re-open the slides and start cutting down text ruthlessly. Do not do anything else. Focus on just one thing in this editing process. Aim for a 50% reduction in the words. Example 1: We will work with the Apollo Tyres slide and try to improve it. The original slide has 108 words. Let us get it down to 50. 1. Club two sentences into one. 2. Write down what happened but do not write the reason. Speak about it. 3. Write in a crisp language. You dont need elaborate long sentences. These three steps have brought down the number of words to 46 which is much better than the original 108. 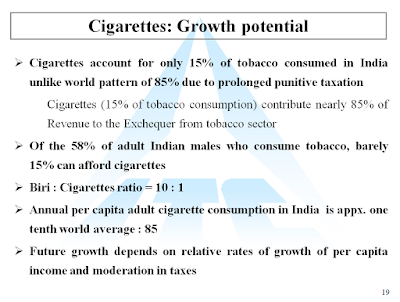 Example 2: Here is a slide from the investor presentation of ITC (India's largest cigarette manufacturer). This slide is very text heavy (word count = 97). It has double the words than needed. Let us assume that you are the presenter and you really feel every piece of text is crucial. What do you do then? How do you cut down the amount of text? You can divide the content into two slides. You can create two slides out of one slide or you can animate the slide. On one click half of the text appears. On another click, the earlier text disappears and the second part appears. This way you will be able to reduce the load on your slides. Click here to learn how to use this animation. I will discourage you from using this method more than once in a presentation. 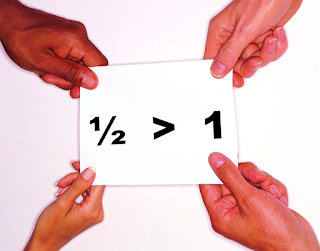 This method leads to zero percent reduction in words. If you apply this method to all your slides, you will only end up in a longer presentation without any reduction in words. Remember today's mantra. Use the 50% rule. Write less and speak more. This will ensure your boss does not hate your presentation any more. In today's post you have learned two methods of reducing text from a slide. How would you cut 50% of the words from the slides of Apollo and ITC? Can you think of any more (and better) ideas? Further Reading:To read more on this topic I suggest this post from Brent Dykes. I totally agree with your recommendations on cutting down the words on a slide...in fact, I'd say cut even more than 50%! For example, in the Apollo slide, the sub-text under the first and third bullet points really isn't necessary. This could be verbalized in the presenter's delivery rather than written on the slide. The purpose of those bullet points is to serve as "headings" to focus the audience. Here are a couple of resources that I've found to be great in expanding my thinking on slide design (and you may already be aware of these). One is Presentation Zen (http://www.presentationzen.com -- both a book and a blog) by Garr Reynolds and Slide:ology by Nancy Duarte (http://blog.duarte.com/). Garr, in particular, advocates an absolutely minimal amount of words for maximum effect. I would agree to you Kathy. If we stick to just three bullets in the Apollo slide that would be even better. But that would increase the work of the presenter. Some presenters in order to remember their data and content might like to put one subhead under each bullet. This is the not the optimal solution but not bad either. On the slide:ology and zen. Ya, I have read the zen and follow both the blogs. You can find the book in my recommended reading list. Garr does recommend minimum words on a slide. I agree to his views. But there are various kinds of business presentations where more text is needed. I have worked in an FMCG company in sales and in my quarterly review presentations I used to share a lot of data. In these cases, I used to design the slides so that superiors don't get bogged down with the content. But in those presentations I could not put just 10 words on a slide. The need was for much more. How we need to use Garr's ideas is to ensure we are visual and have less text. Case to case our need might vary and we need to be flexible to the needs of every situation we encounter. Thanks for raising both the points and thanks too for sharing your thoughts on the blog.